by Richard A. Bitzinger and James Char (Eds.). This edited volume examines the recalibration of the People’s Liberation Army’s (PLA) roles and missions in China’s domestic and foreign policymaking since Xi Jinping’s ascension to power in late 2012. It explores how China’s growing military prowess, along with Beijing’s ongoing shift away from “keeping a low profile,” owes much to the policies of the China’s Communist Party under Xi Jinping’s leadership. The chapters in the book share a central theme: the recalibration of the PLA roles and missions since Xi Jinping assumed the trifecta of party-state-military power. These contributions seek to explore in depth some of the key issues and scrutinize the enhancements in the PLA’s operational capabilities, both in terms of its hardware as well as its “heartware” – the human elements of its development such as operational culture and doctrine. 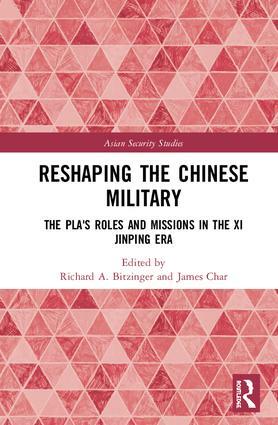 In all, the chapters document the transformative change the PLA has undergone since the profound realization of its previous limitations vis-à-vis the United States’ advanced military operations of the previous century as well as pointing to continuity amid change. This book will be of much interest to students of strategic studies, Chinese politics, Asian security, defense studies, and international relations, in general.